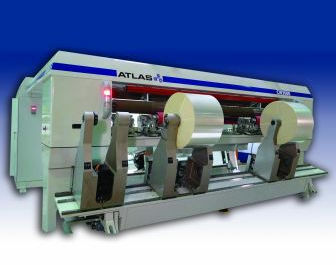 Atlas Converting Equipment Ltd (UK) will officially launch its new CW technology platform for Atlas primary & secondary slitter rewinders for film & flexible materials at CHINAPLAS 2012. As introduced, the new CW technology platform is the new generation of more compact film slitting solutions in web widths from 2.5-10.4m. Equipped with high quality rewind reels, it is said to be more efficient, reliable, effective and operator-friendly at reduced noise levels. The technology also features wireless rewind arm positioning, automatic knife positioning, direct drive web path rollers and running speeds of up to 1,500m/min with more precise web tension control. Atlas adds that electrical cabinets are now fully integrated into the machine so that no “under floor” service trenches are needed and the space required for installation is reduced.